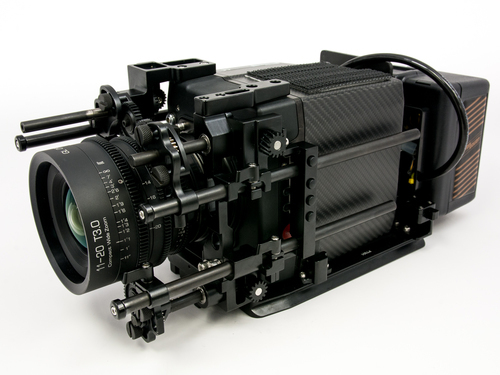 Arri Alexa is the undisputed king of the feature film and commercial production video worlds, and the latest form factor iteration brings the amazing Alexa image quality into a super-lightweight carbon fiber body that is less than half the length of an Alexa XT, and weighs 2.3 kg / 5 lbs. Designed with both owner/operator and rental markets in mind, the Nauticam system is very easy to build. 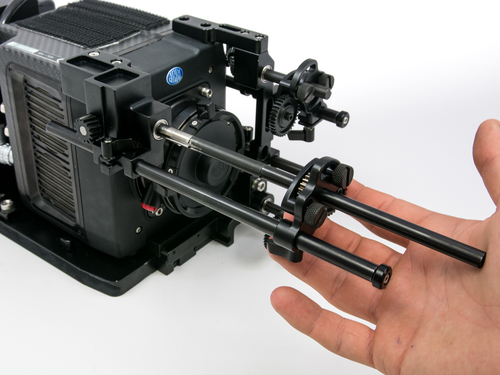 Armed with only a coin and #3 allen wrench, the entire support and lens control system is constructed on the camera base plate outside of the housing. This means the rig can be built on a table, in good light, with plenty of working space. Once the camera is assembled on its tray, the entire system slides into the housing, and locks securely in place. 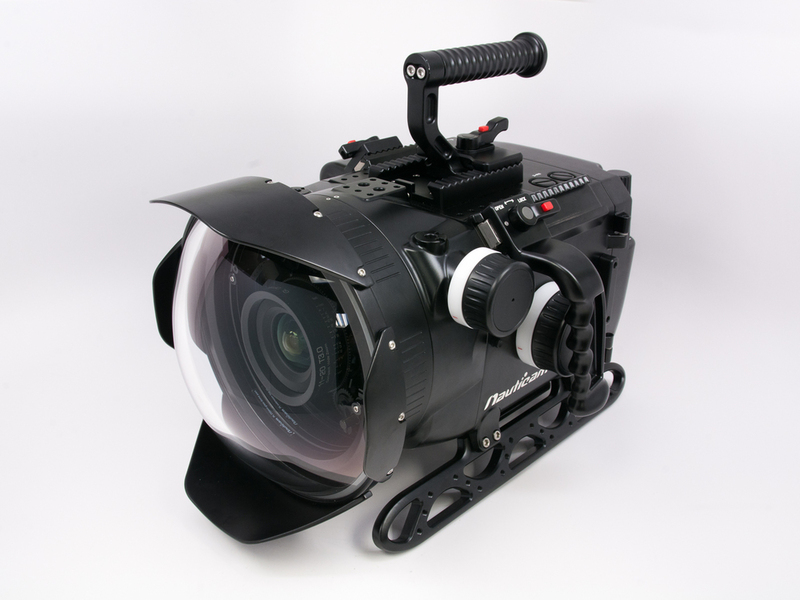 A «C» Shaped support ring is used with very long zoom lenses, providing structural support that allows precise control. The 250mm dome port diameter – 10 inches – is a key for good wide angle imaging performance with many cinema lenses underwater. Smaller domes can work well with close focusing SLR lenses, but many cinema lenses have a longer minimum focus distance in the .35-.40m (14-16″) range. Using Arri Master Prime T1.4/14mm, with its .4m MFD as an example, the 250mm dome provides clearly superior results, with much less corner softness than smaller domes. 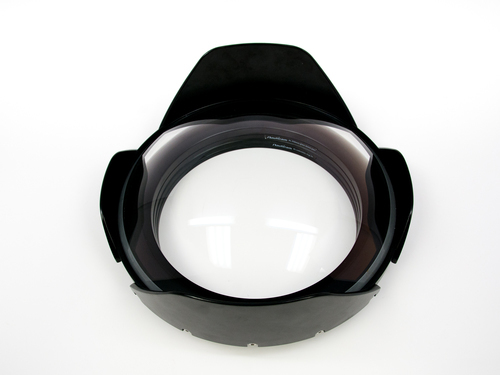 This is the very same dome used in the optical system designed in conjunction with HydroFlex for Alexa65, and used on feature film productions. The glass dome is rugged, and extremely resistant to scratching. Broadband Anti-Reflective Coatings eliminate flare, reflections, and ghosting from the port optic. A robust machined aluminum shade protects the dome, and provides additional flare resistance. 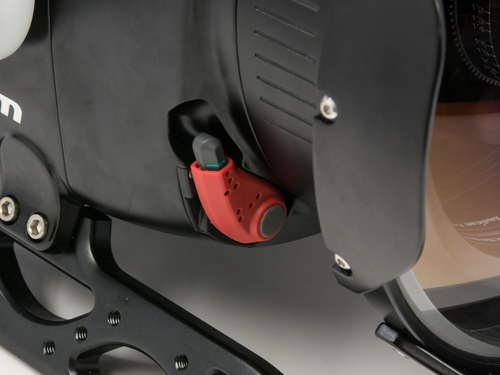 One of the most iconic Nauticam features is the red Port Locking Lever. 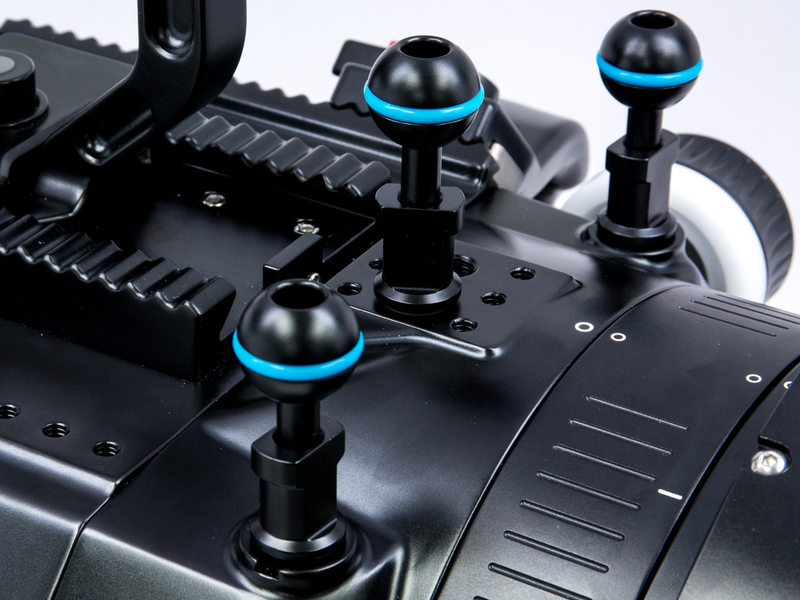 This system uses an internal bayonet, allowing ports to mount directly on the housing, then lock securely in place. No twisting is required, just press in and lock! This simplifies lens changes, and actually reduces the chance of an extruded o-ring causing a leak. Numerous 1/4-20, 3/8-16, and 10mm threaded accessory mounting location are provided. 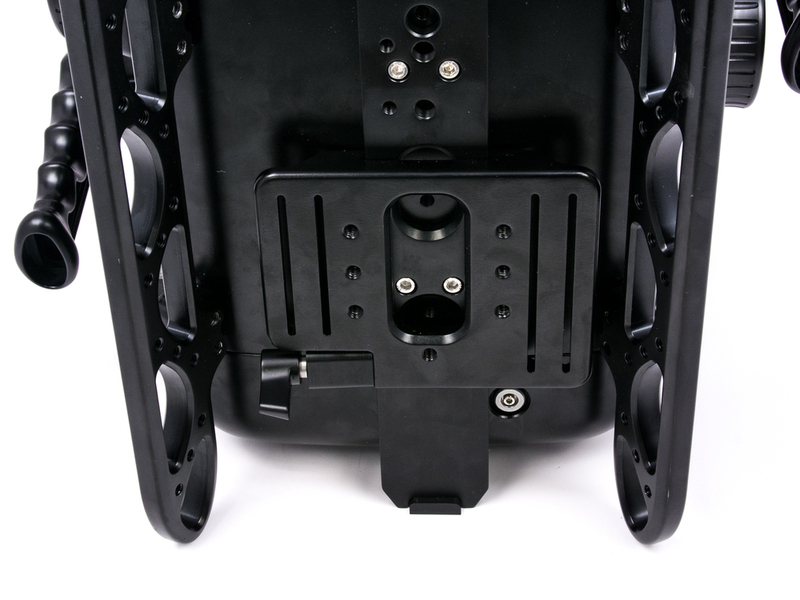 These accessory positions allow monitors, lights, tripod/jib plates, and other accessories to be placed conveniently on the housing. The housing ships with an Anton Bauer «Gold Mount» battery plate and LEMO connector for the Alexa Mini camera. Ample space is available for a range of battery pack sizes to be used in the housing, providing long operation times. Surface suppled power is also an option for for tethered all day shooting. 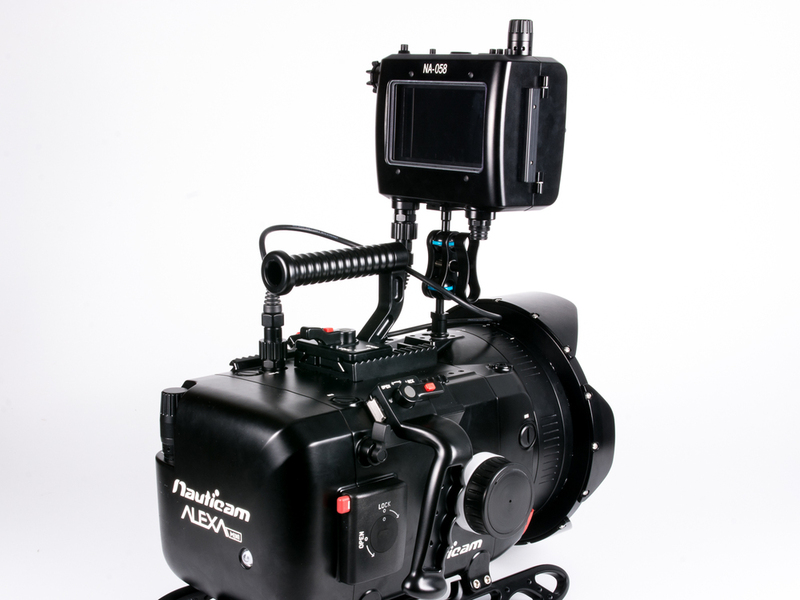 A number of on camera monitoring solutions are available from Nauticam. Options include the smartphone sized SmallHD 502, widely used TVLogic VFM-058, and 7″ Atomos Shogun. TVLogic VFM-058, in Nauticam NA-058 Housing, is shown here. The 5.5″ 1920×1080 screen with professional monitoring tools for judging focus ad exposure is an excellent choice for Alexa Mini systems. Unencumbered surface control is a key need of many top underwater professionals, and those needs have been integrated in as many forms as possible throughout the design process. 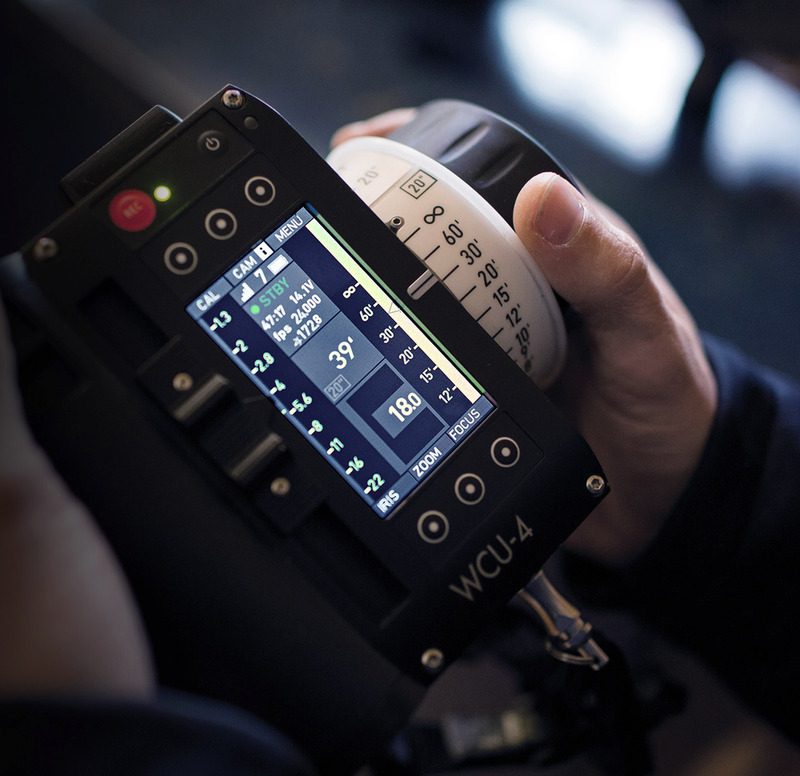 The base «diver controlled» system completely satisfies the needs of a single operator, but our lineup of accessories geared toward production sets makes the Nauticam housing as at home on a feature film set as it is on an Indo-Pacific coral reef. 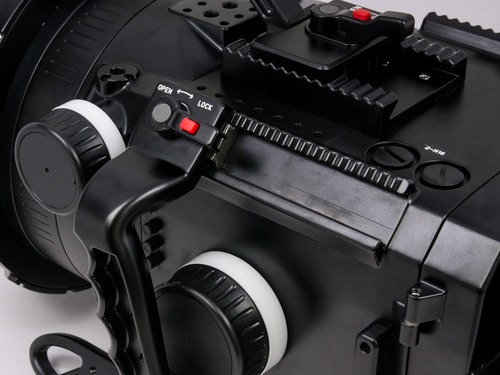 The housing contains enough internal space for internally mounting the Arri «cforce mini» Motors. These motors drive the housing lens controls, not the lens itself, meaning any lens supported the housing can be set up for surface control of Focus, Iris, and Zoom. Alexa Mini features a built in motor controller, allowing the system to be set up without any motor controller box! These motors are mounted on purpose built brackets affixed to the camera tray, and do not need to be removed when changing lenses, or when pulling the camera from the housing. The advanced vacuum check and leak detection system allows the water tight integrity of the system to be tested before going in the water, and an advanced vacuum monitoring system with built in temperature compensation constantly provides operator feedback about system safety. A «dual activation» vacuum valve enables vacuum testing with commonly available BCD inflator hose, or a hand pump for situations where compressed air isn’t available.